What does frugal mean to you? A blogger I read the other day indicated behaviors aren’t frugal unless it was do-it-yourself (DIY). So If I combined coupons with a store sale to save big time on laundry soap that was not frugal. 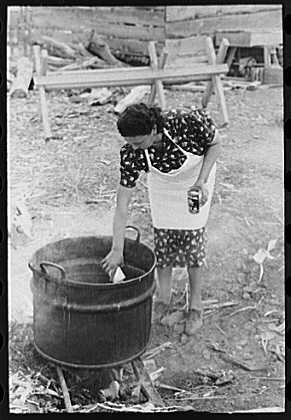 In order to be frugal, the laundry soap had to be home-made. For those that don’t know me, this chick is not going to make home made laundry soap like in the picture above (or any other cleaning products) ever! The statement kind of reminded me of the mommy wars we had a decade or two ago. That was the battles of the working mom and the stay at home moms. We let our differences get in the way of our common goals, interests and needs. 1. Practicing or marked by economy, as in the expenditure of money or the use of material resources. I interpret the first meaning as in practicing thriftiness in use of money and things. It doesn’t say anything about do it yourself (not that there’s anything wrong with that). Mr. Boomer and I are frugal in many ways. Let me give you five quick ways to practice frugality. 1. Save energy. Mr Boomer and I keep our home cool in the winter and warmer than I would like in the summer. We take part our local utility’s summer saver programwhich gives us bill credit for being willing to have our air conditioner power turned off during high-usage days. We also turn off lights not in use and use compact fluorescent bulbs. 2. Book swaps. Libraries are great for free reading, but I’m not good about finishing the checked out materials in the time allotted. My office and our local community center both have self-monitoring book swaps. Mr. Boomer and I take books we’ve read and swap them for books that we’d like to read. It’s a great way for readers to cut book costs and there aren’t any late fees ever. 3. Buy on sale. Sometimes this means buying when you don’t originally plan on it but if it is a PLANNED purchase buy it when the price is right. My mom A wise person told me that clothing retailers are making a profit until the item is marked more than 40% off. That’s why you should never buy clothing or just about anything else at full price. 4 Use Coupons. You can find coupons for just about any service or good you may need to buy. Coupon use is up as a result of the economic situation and there’ s no reason to be ashamed or embarrassed to use them. Don’t waste an opportunity to leave more money in your pocket. Check out my related posts more information. 5. Stop shopping. This seems obvious and I’m not the first to say it, but I find staying away from the stores and shopping websites has resulted in big savings of discretionary income. I love the buys on slickdeals.net but find it hard to resist so I don’t proactively visit that site unless I have a specific need. What does frugality mean to you? How do you live frugally? Controlling energy costs is easier than most people think and it makes a difference every month! A big household might save over a hundred bucks or more monthly. Previous post: Is America becoming frugal?